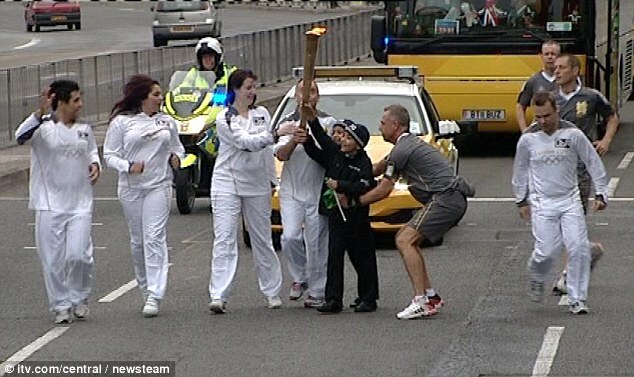 During the Olympic torch relay in Coventry, two young boys broke through security in an attempt to get in on the torch bearing action. Flaming cheek! I’m sure you, like me, are sick to the back teeth of the endless media coverage of a variety of people holding what put simply is a flame in differing locations; honestly, it’s quite boring. The relay hasn’t varied too much throughout its 46 day relay so far, so hoorah for a little action, and a real news hook. The young lads, dressed all in black, managed to break through the barriers put into place and momentarily grab the torch, despite the security guards that were running alongside it, in what could have been a highly dangerous prank. The issue has however been handled tremendously by the London 2012 PR team – what should have resulted in negative media coverage, questioning the security of the events leading up to, and the Olympic games, has in fact resulted in a huge amount of lighthearted and fun coverage about the cheeky boys in question. Not to mention the array of YouTube videos and Twitter mentions of the topic, plus I’m sure there is much more discussion across various social platforms. The general consensus is that these are two young lads, trying to get their moment in the spotlight, in what will be a funny story to pass on to their grandkids – brilliantly handled. Just look at the delight on their little faces. And, it’s spruced up what was getting to be a worn-out, somewhat tiresome story. What does intrigue me further with these young pranksters, is the green flag you can see them holding as they carry out the stunt. I wonder what’s on it? The Coventry Telegraph reported that ‘the police will take no action against the pair’. Nice article Faye, the relay is constantly on the news over here in the US too. Thanks Callum. I’m here in the US for the summer too, the whole relay has been covered to death across both American, and even more so British publications, at least this story made me giggle!